- additional stirrups for fully encased profiles (see clauses 7.6.4(9) and 7.6.4(10)) additional straight bars welded to the inside of the flanges for partially encased profiles (see clauses 7.6.5(4) and 7.6.5(6) and Fig. 7.8 in EN 1998-1). These details can improve the design at relatively low cost, since the additional rebars or stirrups need be present only in the critical regions of columns or in the length of dissipative zones of beams, which are of the order of the beam depth. The positive effect of steel plates and sections encased in a concrete wall. 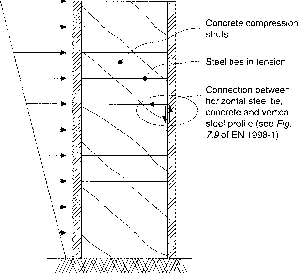 Consideration of steel inside concrete in this way may seem like a repetition of the previous case of the positive effect of concrete encasement around steel profiles. There is a difference, though, in the reference structural element, which is a concrete wall. By transforming a concrete wall into a composite one, the designer can significantly improve the ductility and strength of the wall and solve typical design problems such as providing a higher shear resistance within concrete dimensions limited by architectural considerations. Sections 7.10 and 7.11 of EN 1998-1, which are presented in Section 7.15 below, provide design guidance for reinforced-concrete walls composite with steel plates and sections. Increased damping, in comparison with steel structures, due to cracking and to friction at steel-concrete interfaces. Although commonly recognized, this positive effect on energy dissipation is not explicit in the design process because it is considered that, at the ultimate limit state (ULS), the energy dissipation by damping due to structural elements is secondary with respect to the energy dissipated in plastic mechanisms.